I finally got a picture with most of the sheep, and the ducks got in on it too! Out of all the pictures I’ve taken so far this year, this is the one I can easily see on a poster, with a copy of it hanging right near my front door to remind me in the winter of what it’s like in better easier times. It has been a busy week, surprisingly with harvesting and preserving. Even though we planted nothing to harvest during this time, there have been some latestayers in the garden, so we’ve been able to do some more things. We harvested a few sunflower heads which were ripe if not a few days too early. I’ve never really observed how a sunflower grows so it was neat to see that the seed is formed at the base of the flower while the flower is still attached. I wasn’t expecting that form of growth! The seeds popped right off. We soaked them in salt water then roasted them slowly in a low heat oven. They were yummy and perfectly preserved, not like they lasted long at all. Sunflowers are high on our list for next years growing plan, both edible seed kind and oil kinds. Our one-sister garden, piles of corn, were ready for harvest. They were probably ready two weeks ago and would’ve been ready weeks prior to that had we planted them at the right time! Regardless, we harvested four ears of corn which ranged in beauty from toothless hick to picture perfect cob (albeit with a mini corn cob tip with no kernels). 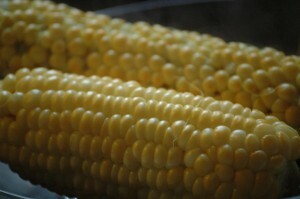 All were equally delicious, more on the starchy side than sweet side, a mealy filling corn. More corn next year is obviously the plan, of many varieties. As are squash and pumpkins. I would give anything to have a field of orange pumpkins growing steadily. Sadly this isn’t the case this year but we are working on it for next year. I will just have to make do with other farm-bought pumpkins and store bought squash. One other plant which produced regularly was the hot peppers bought from a local greenhouse. 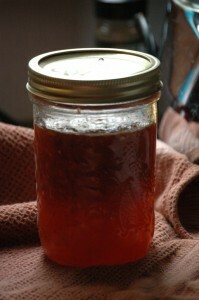 We converted the most recent harvest of peppers with our fridgeful of sweet bell peppers and made some hot pepper jelly. It turned out to be more sweet pepper jelly than hot, I will add more hot peppers next time, and can in smaller containers to make nice gifts. It is very tasty with crackers and cheese. 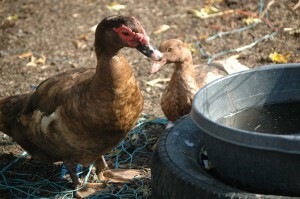 The ducklings have grown up into young adults. The girls have grown down and the boys are pudging up. Pebbles is one of the gang now which pleases me greatly, harmony is peace. 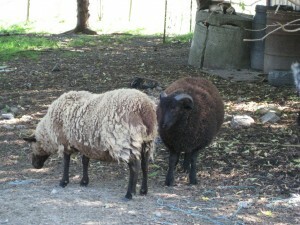 My sheep have grown up as well it seems and are little teenagers working on their pecking orders. Their days consist of eating, resting, eating some more, resting more, going to bed, sometimes having a midnight snack. What a cumbersome life! I am super excited to shear the boys in the spring and not excited to pick out the burrs out of their fleeces for processing. 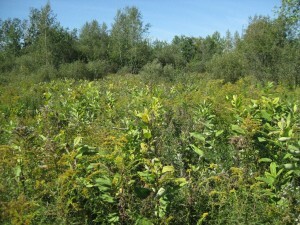 Another lesson learned this year: the importance of eliminating burr bushes from pastures as soon as you see them. Hand in hand, the value of gas equipment over electric equipment is now well known. Sure an electric lawn mower for around the house is ok, but for field and pasture cleanup you want the freedom of gas powered equipment. 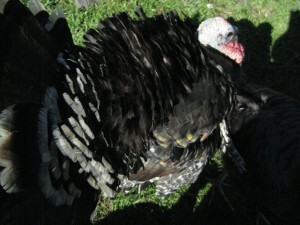 Posted on September 25, 2010 January 31, 2013 Categories Ducks, Farm, Photos, Sheep, Turkeys1 Comment on What’s Up? Time for more of a serious toned post today. Today’s subject is the unreliable nature of some, luckily very few, farmers. And maybe I shouldn’t even say farmers, instead I should use the term “farmer wannabes” because it is only the casual hobbyist farmer who I have had troubles with, never the large scale serious farmers. I have pondered for a few weeks whether to write this post or not and ultimately I’ve decided to write about it but to not use any real names, I feel this is a fair compromise between anonymity and living up to the word you give! Two months ago I answered a post on UsedOttawa. 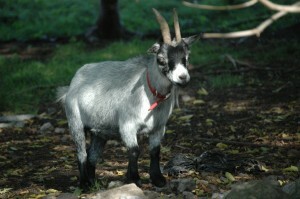 A person was looking for a goat to keep her future new goat company. I emailed her and we started talking about Ruby here. While Ruby is an OK goat, she is too rough for my baby lambs and causes me trouble with Frankie so it is time for her to go to a new home. The person liked Ruby and wanted her on her farm, but could not take her until September. I said no problem as long as you give me a deposit… and she didn’t want to, citing no real reason. That was my first warning bell. I expressed concern about not having Ruby’s future set in stone and she reassured me that so long as she wasn’t sold by September she would give her a home. So I email her at the start of the month to make plans for dropping her off… and I receive no reply. I send her another email a week later… and receive no reply. Not even a “sorry no longer interested” reply – just silence. Finally today I’ve sent her a third email expressing my frustration at this situation. From what I can tell she has chosen to back out of our deal while not even having the cojones to tell me of her change in heart. How cruel, not only to break your word like that but to decimate the future security of this animal. I won’t be able to find a new home for Ruby enough to cover the costs I’ve invested in her thus far, and she simply can’t stay and encourage the other goats to escape during the winter, so it is looking like she will become some meals for us. This isn’t the first situation where a wannabe farmer has become unreliable and affected me. A few months ago I responded to a UsedOttawa ad for free chickens: I gave the woman a call and said I’ll be there tomorrow for the chickens, she said OK. But when I got there she told me nonchalantly that she gave the chickens away the night before, and stood there saying nothing when I asked her why she didn’t call me to let me know. She lived all the way outside of Carleton Place and luckily I was in that area to get sheep supplies so my time wasn’t totally lost, but it was still a burden with no reward. And then there’s the issue with my hay not being cut, and now my straw not being cut. Because of these people, I’ve created a Boo Book, a list of people who I will not deal with in the future. If you choose to adopt an animal for my farm and want to see the Boo Book prior to dealing with your farmer, send me an email: I won’t publicize it but I will certainly share it with others. Perhaps I simply expected more from people who live a farming lifestyle. Now I know that there are always unreliable folk no matter where you go or what you do. I’ve become just a bit more jaded in life. Maybe that’s a sign that I’m becoming more of a real-farmer than a wannabe-farmer. 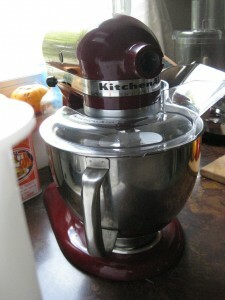 Recently I liberated this KitchenAid mixer from Oldhome. I couldn’t help it – it was sitting all alone in the corner with its parts scattered around. I corralled it as well as some misc baking gear and are putting them to good use here in my kitchen. In fact just a few days ago I used a set of liberated mini silicon muffin liners which made a perfect two-bite tidbit of carrot muffin. I was so impressed that I brought them with me and finally sat down and talked with our closest neighbors the Racine family, who are absolutely lovely people. But that’s another story for another day. I love pierogi, aka perogies, although technically speaking both the singular and plural of pierogi is pierogi – you never eat just one pierogi after all. 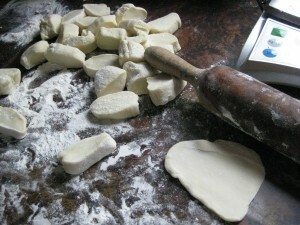 As with many things in life nowadays I got to thinking, how can I make my own pierogi? So I googled it. And read. And now the mystery of the pierogi is unravelled and I am on my way to becoming a Pierogi Master! I’m sure I could make 151 types of pierogi, maybe even 451+. Now, to share with you the secret of the pierogi. There are two parts: dough and filling. 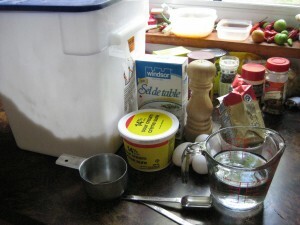 The dough is a non fermenting dough so you can make it anytime; I actually found that using it the day after, cold from the fridge, was easier than using it fresh. The filling can consist of everything and anything. I used leftovers from my fridge as well as some random ingredients I had on hand. I recommend you try the same! Mix the eggs together, mix the salt and water together. Mix together four cups of flour with everything else and gradually add the last cup of flour in as you knead it for a few minutes. Voila, a dough! A LOT of dough. I put half of it in the fridge and still had too much dough left out. For your stuffings you can use pretty much anything you have on hand as long as you mix it up with potato – the goal of the stuffing is to be able to make it into little balls easily, and crumbly things fall apart, but not once you add some potato! Above I have potato with red peppers, onions, and mushroom, potato with cheese, and 100% meat. 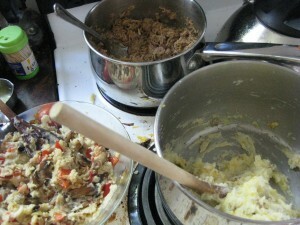 For my next batch I mixed the meat with potatoes and it was much easier to spoon out. Learn from my mistakes friends! Now, let’s assemble the pierogi. 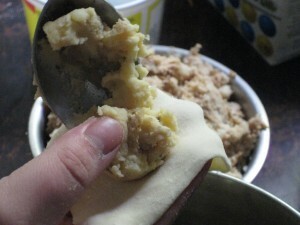 Divide up the dough before filling. 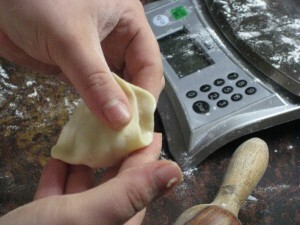 I ended up using 13 grams of dough per pierogi, prior I used double that and got double sized pierogi, it’s your choice! 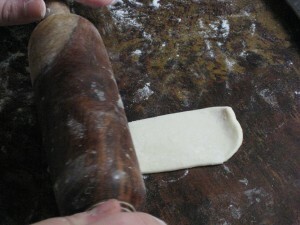 Roll the dough out long and flat. Stretch it out a bit with your hands when it doesn’t comply. Which it will. 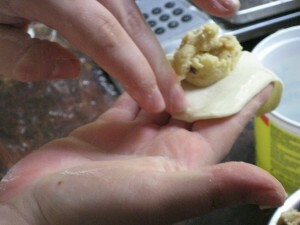 Lay it out on one hand so that half of the dough goes over your fingertips. Add a small spoonful of stuffing. The key here is to not let any touch the outer rim of dough: wet dough sticks to dough but it doesn’t stick with potato in the middle! 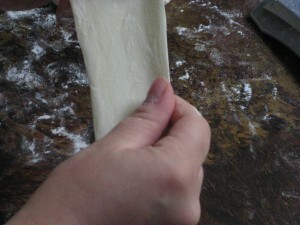 …then fold the dough flap over and pinch it shut! Try to get out the air as you go by smoothing the pierogi from the middle out, but not too hard lest the filling come out too. Yes it’s a challenge, but all good foods are challenges! Now repeat 29 more times and voila, 30 pierogi! Pierogi making does take a bit of time to do so I advise sitting down and spending an hour or two making tons of pierogi, flash freezing them by putting them on a baking sheet in the freezer for awhile then transferring into freezer bags for longterm storage, and continuing until you are out of dough or stuffing or become tired of making pierogi. Now I have three bags of delicious pierogi ready and waiting for the day when I need a fast meal! Holy guacamole friends, it is COLD nowadays! No more sleeping with the windows open, that’s for sure. No more prancing around without socks as I so love to do. The garden knew what was coming and finished up its summer production 10 days or so ago. The weather is perfect for fall vegetables like beans, lettuce, leeks, kohlrabi etc… but of course my garden is full of turkeys so I can’t grow anything. Big mistake eh! Luckily we have our hands full with cleaning and tidying up for winter. We will have snow sooner than I expect so now is the time to get rid of all the junk on the lawns. 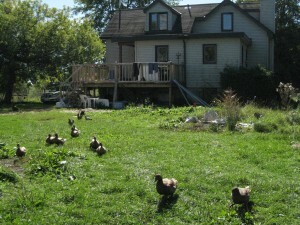 Now is also the time to think of moving the rabbits into the barn and setting up the turkey pen. The sheep love this weather. 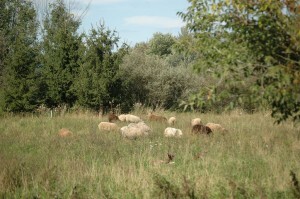 We were able to witness some new sheep behaviour: hormone time! The ewes were challenging each other as were my boy lambs. As with most sheep disputes this was done via headbutting. No one is getting hurt, but it is interesting to see Macaroon become the queen ewe by challenging others. Ginger Rogers spends her time around Frankie. She knows her time as leader is up but hasn’t been formally challenged yet. Speaking of Frankie… The recent hormone surge has made him into even more of a brute than before. He is back to playing a favorite game, Bash This Gate As Hard As I Can. Let me tell you, he can bas it hard. It’s quite scary, worse is when he gets it open and is waiting for you to open the lobby door… Compared to my two other breeding lambs, he is the worst tempered and most dangerous one. As I don’t think I’ll be able to divide the pasture up in time, eliminating one ram makes my job much easier, and eliminating the sheep with the worst fleece will improve my future fleeces faster. So let this be your last warning Frankie, shape up or ship out. My fine feathered friends enjoying the sun and grass. 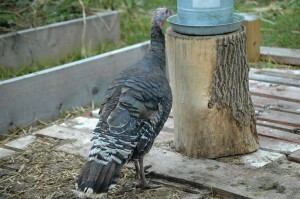 One of the toms displaying. They’ve grown so large! 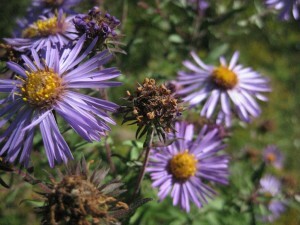 Anyone know what these flowers are? They sure are pretty. 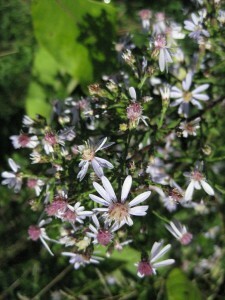 There are some little mini daisy-like flowers too. Mom wanted to see a picture of Peebs, so here you go mom! That’s his mom Ginger Rogers to his left. He’s pretty much as large as she is now, and I can still catch him trying to get a splash of milk from mom. What a sucker. It has been so dry this year that this normally wet depression is without any wet spots whatsoever. 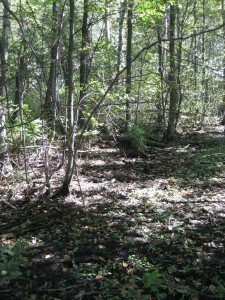 There is a lot of felled wood drying out, I think I’ll go harvest some in the coming days. Our vegetable growing season is pretty much at an end. We didn’t grow hardly as much as I wanted to, mostly because I was not organized enough and we didn’t have the manpower to till massive amounts of land, and also events like putting the turkeys in with my raised beds means I can’t start a fall garden without it being eaten. All of these issues are going to be remedied this and next year. I am working on a few uber plant charts so that we can easily select and plan for plantings next year both in timing and location, and of course the turkeys will live in a different home far away from our food! All in all though, even given our limitations and lack of knowledge, we didn’t do too bad for our first year of gardening and livestock raising. I’m way too close to this farm to view it objectively, and it’s only when I list off this year’s achievements to friends that it really sinks in – we have done a lot of work, we have experienced a ton of new things. Sure it’s not as much as I wanted to have done but at least it’s something!